For the 2019 Grammy awards 3D Live teamed up with Red Pill VR to showcase their Virtual reality DJ program on 3D Live’s 3D LED. Great interview with California's Great America's own Brian Miller about integrating live performances with our "holographic" 3D LED displays at the amusement park's award-winning Mass Effect attraction! NEC Display Solutions of America, Inc., a leading provider of commercial display and projector solutions, announced a collaboration effort with 3D technology innovator 3D Live that combines the company’s expertise in 3D technology with NEC Display’s industry expertise. Together they are evaluating next-generation 3D display solutions that incorporate direct view LED (dvLED) and passive 3D technology. This technology could be another option for the entertainment industry and cinemas who want to deliver the ultimate immersive experience through alternative technologies. 3D Live was featured in the most recent issue of Lighting & Sound America Magazine. The article discusses 3D Live's recent achievements including The Mass Effect New earth 4D attraction as well as recent Concert and VR work. Great article about 3D Live's recent achievements and recent TEA award for "Innovative Technology, recognizing its Holographic 3D LED display"
The Themed Entertainment Association has announced 3D Live as the winner of the Innovative Technology Award for their 24th annual Thea Awards for the Mass Effect: New Earth ride. 3D Live and Flying Lotus have been nominated to the 29th Annual Pollstar Awards under the category of Tech Enhancement of the Year! Check the whole list here. Another great review / interview talking about Flying Lotus new tour. Check it out here. 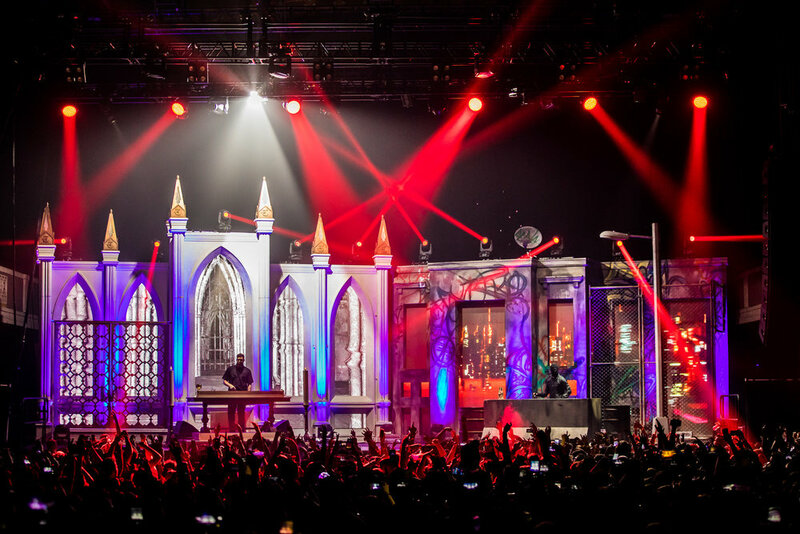 3D Live teamed up with performers Tchami x Malaa to produce some awesome visuals for their recent stage shows in Los Angeles and Las Vegas. Check out this interview with Flying Lotus about his upcoming Stereo 3D tour with 3d Live. History was made last night at the 2017 FYF Festival in Los Angeles, when Flying Lotus revealed a groundbreaking holographic visual show to accompany his musical performance. 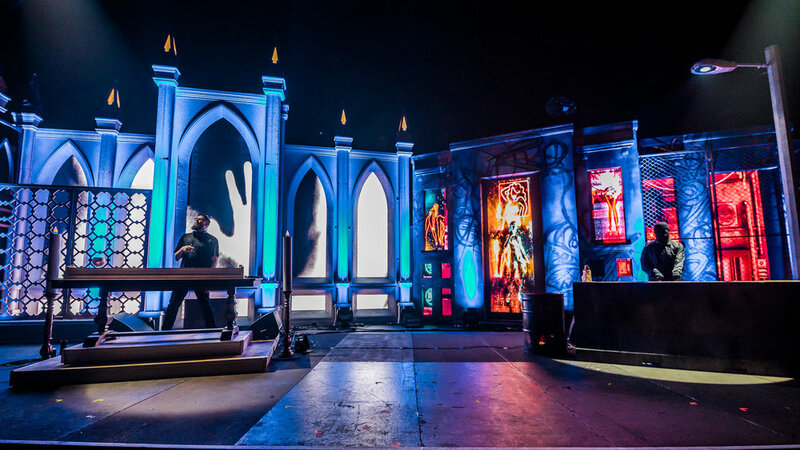 The show, another collaboration between 3D Live | AXO and Flying Lotus's visual team, astounded the festival attendees at LA's Exposition Park with never-before seen stereoscopic content, custom-build for 3D Live's holographic 3D LED wall. Audience members knew to prepare themselves for something special, as custom-designed stereoscopic 3D glasses were shipped out to every ticket-holder as part of the FYF welcome package. The glasses, which were branded with Flying Lotus's logo, along with those of his labels– Brainfeeder and parent Warp Records– contributed to the air of mystery surrounding FlyLo's set. Needless to say, once Flying Lotus took the stage at 12:20 AM, closing out FYF's Friday lineup, no fan was disappointed. FlyLo's otherworldly music paired perfectly with the visual show, a rollercoaster ride through images that are equally beautiful, visceral, and mind-bending. The content itself was tirelessly crafted by AXO's lead designers– Aron Johnson and Ian Valentine– working closely alongside Strangeloop, Flying Lotus's long-time visual collaborator and live VJ. The stereoscopic conversions of all content were done by 3D Live. This performance, including its visual elements, marks a game-changing moment in the world of live music. The show is peerlessly innovative, both in terms of the fearless and dazzling artistic content, but also in its mind-blowing 3D delivery on 3D Live's patented 3D LED wall. The FYF audience was appropriately stunned by the immersive, holographic 3D visuals that surrounded Flying Lotus during his FYF performance– boding well for the introduction of stereoscopic 3D into the live performance arena. 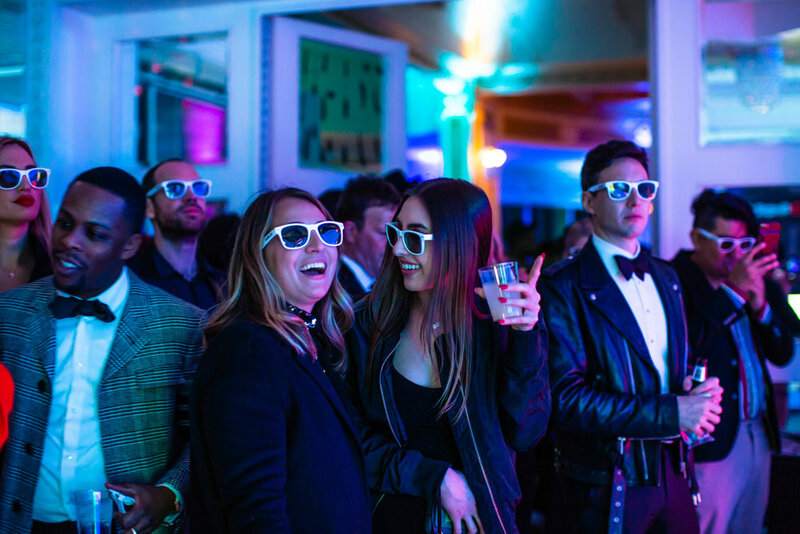 On May 4, 2017, 3D Live joined forces with YouTube Space LA for a blissful evening of outdoor music and drinks, along with a whole host of VR demos from various sponsors, at YouTube's beautiful Marina Del Rey campus. The event, aptly named "VR Happy Hour," featured headlining DJ Jen Lasher, performing in front of 3D Live's holographic 3D LED. 3D Live's own Crash Override warmed up the decks, and provided VJ Services throughout the entire night, with 3D Live's custom 3D content astonishing spectators from beginning to end. NRG, our partner at Super Bowl Live 2017, astonished guests with a "holographic" stereoscopic 3D LED experience designed to promote sustainable energy. NRG Energy, a Fortune 250 company, is the premier 21st century energy company that provides consumers and businesses the renewable energy choices they want. Housed in an immersive tent showcasing a custom-built 3D experience, 3D Live introduced NRG’s sustainable energy services to a whole new generation of eco-conscious consumers. This 10 minute video ran 8 hours a day for the 12 days leading up to the Super Bowl in Houston. Our patented 3D LED system coupled with our expertise in the stereoscopic field enables us to generate strain-free viewing experiences. Our 4D attractions are portable and have traveled all over the entire world (UN Climate Change Conference in Paris, South By Southwest, FMX Conference in Germany, Broadcast Asia in Singapore, and beyond). TMZ captures our holographic LED backdrop for a Ray Sremmurd birthday party. Rae Sremmurd brought 3D Live's stereoscopic 3D LED wall to DTLA's Think Tank Gallery, to provide a holographic backdrop for member Slim Jxmmi's superhero-themed birthday party. 3D Live exhibited a dazzling AXO-created Gotham-esque skyline, with Rae's customized DC comics brands floating out into 3D space. TMZ tells the story, in pictures and a video, of the wild antics that ensued. USA Today has announced the 10 Best New Amusement Park Attractions, click through to see the full list! 3D Live is pleased to announce that Mass Effect: New Earth, our unprecedented 3D LED augmented reality ride, has ranked as one of USA Today's 10Best New Amusement Park Attractions for 2017. Mass Effect: New Earth, which you can experience at California's Great America, is only one of the THREE ranking rides on the 10Best list that 3D Live / AXO was involved with in 2016. Last night, Deadmau5 live-streamed his brand new album, W:/2016ALBUM/, and also unveiled the incredible new Cube 2.1, an LED stage installation with moving mechanical panels and graphic content designed by 3D Live's AXO, working alongside Production Club to combine unrivaled stage technology with unrivaled motion graphics. The album stream, foreshadowing a 2017 tour, featured 3D Live's own VJ to mix all of the stunning graphics together into a breathtaking auditory and visual experience. The video below for Deadmau5' new song "Let Go," chronicles the work that went into the live show, as well as Cube 2.1 in action. ‘Ion Torq” puts you in a full-sized ATV for cooperative multiplayer racing with weapons. At the International Association of Amusement Parks and Attractions (IAAPA) trade show in Orlando, 3D Live and MediaMation showcased a brand new motion simulator virtual reality ride called Ion Torq. Developed by 3D Live Axo using Epic Games’ Unreal Engine 4 technology, the experience introduces a brand new virtual reality video game that seamlessly connects with full-sized ATVs that have been customized to authentically replicate the in-game driving action. The holographic LED allows spectators and people waiting in line for the ride to experience what the players wearing the headsets are seeing. When a giant robot arm comes out over the ATVs in the game world, it also reaches out into the audience. Patrons can now interact with the virtual environment like never before. In association with Microsoft and Dell, 3D Live | AXO's Lunar Drive, a mixed reality experience, was installed in the Microsoft Store on 5th Avenue in Manhattan, New York. The Lunar Drive MR evolution allows players to hit golf balls in VR that are, almost magically, tracked into a video wall that is visible to spectators . This experience utilizes the HTC Vive HMDs and Alienware Area 51s. If you are visiting Manhattan, drop in and take a swing! But be aware, this install only runs for the 3 months up until Christmas. The Virtual Reality Los Angeles 2016 Trade Show proved to be the perfect opportunity to showcase our most recent AR/MR experience. We partnered with VRLA, SubPac, The Wave, and WeLens, to create a never-before-seen synthesis of VR, holographic visuals, realistic tactile bass, and live music and dancing. The Wave is a groundbreaking multiplayer VR application in which the user can both mix songs together and create music in a colorful, incredible 3D virtual environment. We worked with them to bring that environment outside of the headset and onto our holographic 3D LED screen, to bridge the gap between VR and the outside world. SubPac provided their wearable devices to make dancers feel like they were at a real music festival, with massive pumping bass attached right to the wearer's torso. WeLens provided a fleet of VR headsets, and made it possible to synchronize the VR experience across the whole dance floor. The combination of all of these technologies made for the most futuristic and otherworldly VR rave experience that's ever existed, and one that is difficult to beat! When guests entered the dance floor, they were fitted with a SubPac speaker backpack, equipped with a portable subwoofer built in for tactile sound. Audience members then chose to wear Gear VR headsets (provided by WeLens), or use our stereoscopic 3D glasses to experience the holographic virtual world. Real DJs, like Jen Lasher (pictured above) and GRIMECRAFT, took the stage– using HTC Vive controllers to mix tracks together, add effects, and control the visuals behind them in 3D virtual space. Famed artist Android Jones also appeared, creating a virtual art piece at our exhibit. He used Vive Controllers as his brushes and the space all around and in-front of the LED wall was his canvas, producing visually stunning 3D artwork with unbelievable depth. The virtual holographic visuals flew off the LED wall, floating above and around the VR rave-goers. Altogether, the event was a tremendous amount of fun, and thanks to our partners at SubPac, WeLens, and The Wave, it was also a landmark in immersive media presentation. We can't wait to see what next year brings! After the close of this year's E3 Entertainment Expo, VIP guests were invited to an afterparty, hosted by 3D Live, and sponsored by Alienware. The VIPs were able to enjoy a 3D Live Hololens AR experience, watch 3D Live's Mass Effect: New Earth content on a 3D TV, ride Cry Out: The Lonely Whale– a 4D VR experience, play Lunar Drive on the LED wall, and play-test different VR installations. At the end of the night, guests gathered around the 3D Live's patented 3D LED wall as DJ Jen Lasher performed with our holographic 3D visuals exploding off the screen behind her.